At IMPERIAL Hino we know that once you have bought one of our excellent Hino commercial vehicles you need someone to take care of your pride and joy. We are that someone. 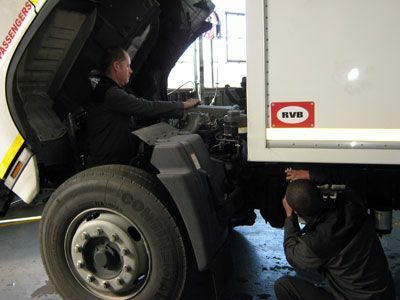 With well equipped service centres and experienced technicians we are well able to perform minor services, major services and all other repairs on your Hino trucks when required. Our technicians undergo continuous technical training to stay abreast with the latest developments in the Hino range. Our workshops comply with the criteria set by Hino SA and we have all the specialised tools required to do expert repairs on all Hino trucks. Our workshops also do engine and gearbox overhauls, brakes, clutches and all mechanical repairs. Our rates are competitive and we offer customers the opportunity to open an account with us. Customer satisfaction is very important to us and all our workshop teams strive to achieve the highest possible score when our customers are surveyed to establish what their service experience was like. As part of the Hino dealer network all IMPERIAL Hino workshops respond to breakdowns when requested to do so via the correct channels, this includes after hours road side assistance.